As a young man, my father always told me never put a straight razor on my face. He said it would make the hair grow back faster and thicker. Myth or not, I never did put one on my face until my first professional shave at Martial Vivot. It was the closest shave I ever experienced. Since I’ve had enough hair on my face to shave, and man I couldn’t wait to be like pops and put a hot towel on my face followed by some Noxzema in the morning, I’ve used an electric razor. Dad gave me a Remington and I still have it to this day. It’s served me well and I’ve used others here and there but I never realized what I was missing until I was asked to review the Philips Norelco SensoTouch 3D 1250XCC. For this occasion, I took the opportunity to begin wet shaving since the 1250XCC is capable of both wet and dry shaves. In the past, I only dry shaved because it’s what I’m used to and quite frankly, it’s quick. Nevertheless, I told myself I’d get into it and I went all the way, shaving cream, brush, etc. From the very first use I was impressed at how close it shaved. According to its marketing materials, it possesses patented “super lift & cut action.” Its three shaving heads also have Ultra Track technology, to get the shortest of hairs and “each track is designed with the purpose of cutting a particular type of hair. The outer track is responsible for cutting the normal length daily hair. The inner track will cut the small stubble, and the middle track is able to get the flat lying hairs.” However it works, it truly reminded me of my straight shave. There was no after-burn but I did experience mild irritation, which should be expected when using a new razor. Once my face got used to its cutting technique, it was smooth sailing from there on out. And while shaving can be a drag, I actually looked forward to it. From the first time I used the 1250XCC, it took approximately two weeks before I needed to recharge it. I shaved consistently every other day and for me, that in between charge time was impressive. The machine is sleek, feels good in your hand and glides across the face with relative ease. Its motor is also quiet, which is a nice touch. When your past includes clippers and a very old razor given to you by your pops, that becomes a noticeable feature. I was turned off by it’s out of the box appeal. It just seemed like so much stuff. The model I have comes with a charging station, a base unit that houses its jet cleaning system, a slick traveling case and a few other miscellaneous pieces. After sitting with it for a while, I realized, I was use to Apple’s plug it up and go. I clean the shaver’s heads after every use so if I was given a chance to choose between buying it with or without the cleaning system, I probably would’ve opted to go without it. Now that I’ve used it, I’m glad I never had to make that choice. The jet cleaning system is a great feature as it really cleans it thoroughly and let’s face it, when you’re pressed for time, how well are you really going to clean it? That extra attention the jet system offers is worth it and your face will be better for it. The one con for me was the trimmer. It’s not as sharp as I’d like it to be. Overall, I am very impressed with this machine. Retailing for $249.99 it’s worth every penny. When you’re putting something on your face as often as your razor, why shouldn’t it be the best? 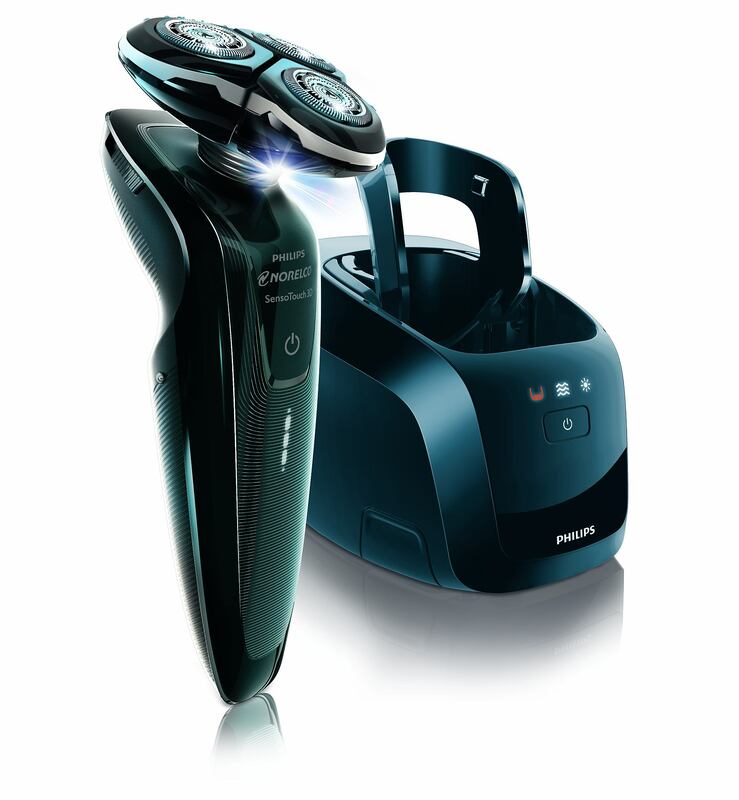 The Philips Norelco SensoTouch 3D 1250XCC cuts so close that even my wife gave it a thumbs up and commented on how smooth it left my face. A Philips Norelco SensoTouch 3D 1250XCC was sent to me for this review. All opinions are my own. This entry was posted in Grooming, Product review and tagged Grooming, mens grooming products, nen's grooming, Norelco, Philips, Shaving, wet shave supplies. Bookmark the permalink.